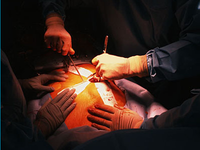 Link: Cellphone lights enable operation to proceed in blackout - Engadget. Okay, this might not have been funny to the patient on the operating table, but Doctors in Argentina might have found a good use for IPhones. When the hospital lights went out, everybody gathered up their cell phones, and used the glowing LCD light to continue the operation. No word on whether one of them got dropped into the patient. I once lost a Treo to a toilet bowl when it fell out of my pocket while I was leaning over to flush. Yeah, Yeah, too much information. Link: Michael Scrivo's Personal Site - Outlook on the Desktop. This free download is very cool and useful. I am an Amicus Attorney guy, using it for case management. It syncs with Microsoft Outlook, so the apps have the same information. Outlook works great for calendaring, contacts, and task management. 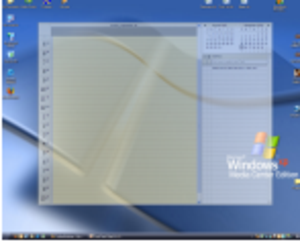 So, to have an active copy as part of the desktop, with a transparent look and feel, is like having a paper calendar on your desk, that is fully interactive and functional. Making a Microsoft application more useful; go figure. Link: Dell pushes for better Linux drivers - Systems & Components - www.crn.com.au. I had a feeling that the marriage of Dell and Ubuntu Linux as business partners might spur large scale usability enhancements in Linux. This post proves me right. The power of a large company like Dell will likely push vendors to provide linux drive support for their products; especially in the video driver category, where Linux has difficulty. Thanks, Dell. BlawgWorld 2007 Link Well, Hell has frozen over. The swallows have abandoned Capistrano. Santa Claus has gone on strike. 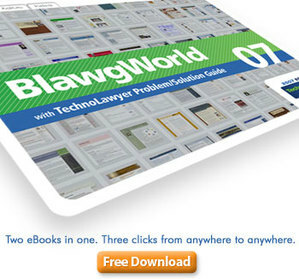 The FutureLawyer has joined the club of legal bloggers chosen to be featured in the annual TechnoLawyer book of legal bloggers. While I am honored to be among the elite, I am reminded of Groucho Marx, who opined that he wouldn't join a club that would have him as a member. But, here I am, and I have to make the best of it. You can download an interactive PDF version here . I really like most of the highlighted blogs, and you can learn something from all of them. This year, the folks at TechnoLawyer have outdone themselves. They have added a second EBook, called Problems and Solutions, that has tips and tricks to make you a better and more efficient lawyer. Even the FutureLawyer. Somehow, though, I don't think there will be thousands of people standing in line at Midnight waiting to read our blogs. But, what are you going to do? It's always something. Link: Free People Search by ZabaSearch!. As lawyers, we are always looking for information, to assist in our practices. Whether we need a prospective Defendant's address, or other information, the Internet has millions of freely available public records. The problem is, how to get at it? You can spend a lot of money on a paid site, like Lexis' Accurint, but why not see whether the information is available for free. Zabasearch combines public databases from all 50 States into one, plain vanilla, easy to use, search engine. After you Google the name, this is the next place you should go if you are looking for public information. 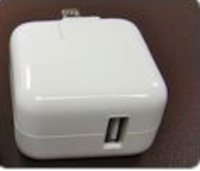 Link: MacNN | iPhone AC adapters failing. I know. After awhile, pointing out the shortcomings of the IPhone seems like piling on. But, I have a duty to my readers, before they spend a lot of money on one of these things to point out the problems. What if a good friend were having a mid-life crisis, and dating someone whom you suspected was too young, too beautiful, and, well, you get the picture? Would you warn him? Of course, if I were given such a warning, I would ignore it, and learn from my mistakes. So, go ahead, buy that $600 IPhone. Lock yourself into a two year contract for Edge Internet slow speed. But, don't come crying to me when your charger adapter won't work.Thanks to Zale Dowlen for the heads up. Link: Ubuntu creator claims more Linux-based Dells to emerge - Engadget. I love the fact that two of my favorite computing companies are getting married. 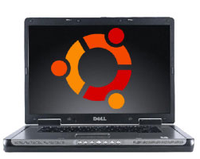 Dell and Ubuntu are expanding their partnership, and more Dell computers will be offering Ubuntu Linux as the operating system. Dell created the personal computer direct sales model, and so it is to be expected that it is on the leading edge of the coming OS transparent world. Try Linux in your law practice. Your wallet, and you, will be glad you did. Would That It Were So! Maybe the IPhone fanboys think that their new IPhone will do this? When I saw this cartoon, I thought of all the people paying big money for Vista. Link: Abstract Appeal -- by Matt Conigliaro. We have come so far, and yet, not far enough. This post from Matt Conigliaro highlights the problem with current Rules of Procedure and Statutes; and, I bet this problem isn't limited to Florida. Why isn't this lawyer permitted to serve innocuous notices and documents via email with PDF attachments? Rules Committees in jurisdictions across the country need to look at, and update the Rules, to account for the Internet and electronic documents. We have been working on electronic filing in Florida for some years, and I only know of one County in my area that uses it; and, even then, it is limited to probate. What do you think? Should this lawyer be permitted to file notices via email and PDF attachments?